Soon after midnight on 14 November 2016 the city was awakened by the shock waves of a 7.8 magnitude earthquake. The Kaikoura earthquake was one of the most complex ever recorded, with 21 faults rupturing over 180km. As the energy focus raced north, it shook Wellington, damaging buildings and waking the city. Wellington City Council had to mobilise fast to evaluate the damage and react to a rapidly changing environment. The Mayor, Councillors and senior government officials needed to be briefed and they needed real-time information in pictures to assist with decision making and communications to avoid loss of lives. Many Wellington central city buildings were seriously damaged during the earthquake. The City Council was under pressure to cordon off the city. Building assessments and decisions had to be made under extreme conditions – high winds and torrential rain and damage to the city’s port and infrastructure and disruption to transportation. Current information needed to be shared by the council’s Emergency Operations Centre with specialist council teams, government agencies and other organisations. The right decisions needed to be made about evacuations, cordoning off streets and demolishing buildings to prevent any unnecessary restrictions to the city’s usual activities. In this emergency situation geospatial tools supplied by Eagle Technology, the Esri distributor in New Zealand, were used in conjunction with 3D data enabled the Wellington City Council to evaluate what was happening in the city and to analyse, communicate and act across its Emergency Operations Centre. Geospatial became an important unifying aspect as the event developed, allowing a common understanding to be developed among those on the ground gathering information, as well as among officials briefing leaders and the media. Esri’s Survey123 for ArcGIS enabled the rapid collection of first information from the field and visualisations of data being produced in conjunction with the people collecting it. By using geospatial tools combined with 3D data the council was able to showcase a realistic view of the extent of the building damage and the potential problems that lay ahead. Esri’s tools such as Collector for ArcGIS, ArcGIS Online and ArcGIS StoryMaps along with expert advice from Eagle’s consultants, created a core spatial platform that was accessible across the organisation and to other specialist agencies. Esri WebMaps and WebScenes were deployed as common operating pictures tailored to specific teams. Project information was sent from the council’s Emergency Operations Centre to specialist council teams and other organisations. 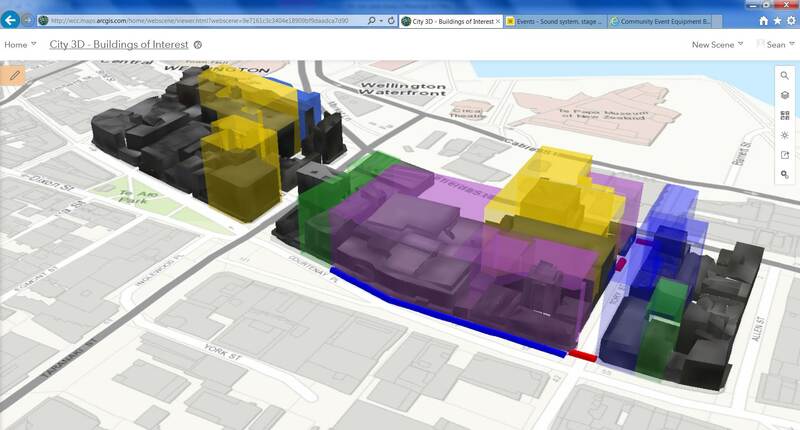 The use of 3D data and real-time scenes became a vital capability for calculating safety zones surrounding buildings, placing these zones in context and viewing the surrounding streets to make cordoning decisions. Where possible, information was shared with the public using configurable, intuitive Esri ArcGIS StoryMaps. In parallel – Eagle’s Emergency Management consultants worked with several agencies across the Wellington, Marlborough and Canterbury regions to collate and assemble data as well as assist with focused advice for emergency management purposes in relation to this emergency being viewed at a national level. By being able to access more accurate information in real time the Wellington City Council was able to be proactive rather than responsive in its management of the emergency. The information gained from using geospatial tools was used to brief Government Ministers, the Mayor and Councillors. It gave senior City Council officials the confidence to make the necessary tough decisions in a timely manner in a rapidly changing environment. They were able to assess the extent of earthquake damage, and decide on the most appropriate responses to make. The innovative way in which the geospatial tools were used in conjunction with 3D data resulted in better, faster decision making. WebScenes allowed the fast, intuitive briefing of leaders. 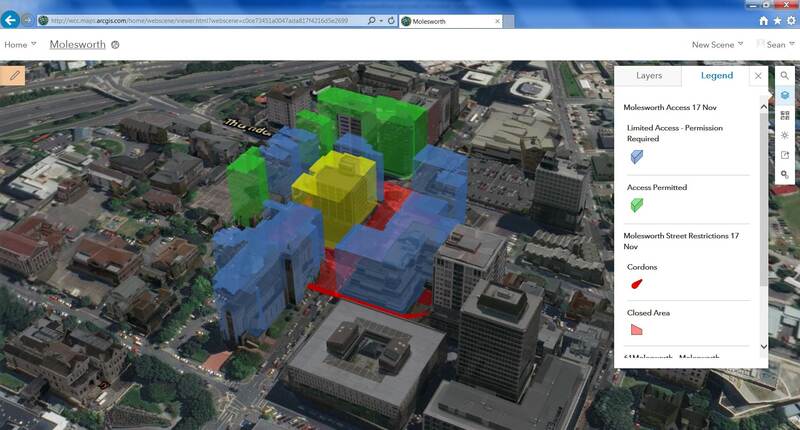 The council was able to use its 3D data on the back of their enterprise Esri ArcGIS platform. The event could be placed in scale using 3D data, showing decision makers the operating scale was street by street, and that the cordoning and closure of the city’s entire central business district was not necessary. This prevented potentially enormous disruption to lives, loss of economic activity, logistical issues and, more importantly, loss of community ownership of the places people live in. Over 1600 multi-level commercial and residential buildings were inspected, streets were cordoned off, residents were evacuated from affected properties and severely damaged buildings were demolished. Challenge: To access and share real-time information about Wellington city damage following a major earthquake, to enable timely decisions about how to react to the emergency in the most appropriate ways. Solution: Esri’s ArcGIS Platform and 3D data gave the Wellington City Council the tools required to analyse what was happening in the city and to analyse, communicate and act across its Emergency Operations Centre. Results: The council had the right information to make key decisions about evacuations, cordoning off streets and demolishing buildings.